It was a gorgeous weekend. Friday night-I ended up getting my gift after I walked outside and saw my husband showing it to the neighbor. 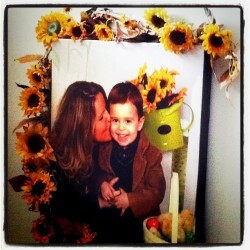 I had a mirror in the foyer with Sunflowers around it-and I took it down to put this gorgeous canvas up. He's great at special things. 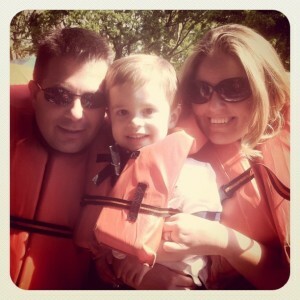 Us right before the Duck Paddle Boat ride.I love my husband. I know it's 'Mother's Day' but I have to give him props. He really tries to go above and beyond. I could totally tell how proud he felt of himself for getting such a great gift. Saturday we went to the zoo to be apart of the wonderful Cradles 2 Crayons Spring Greening Event that Tara & I with Moms On The Spot promoted. We haven't been to the zoo in forever. I don't really even know why!! I guess cause I honestly didn't think he'd be a big fan of it yet. It was an awesome time though. Tara & Isa explored the zoo with us. Then yesterday....we went to my FAVE place to eat. It was a MAD HOUSE. Of course. It's Mother's Day...but we went to Cracker Barrell. LOVE that place!! Then we went to Smith Playground after that. Boston just loved that place. And it was great to be able to share that experience and afternoon with Matt. It really turned out to be an awesome weekend. I'm so thankful to God for getting me out of that rut. In case you didn't get the chance to read my story with Postpartum Progress yesterday. Here's the link where I come clean about my battle with PPD. I was a bit disappointed that she edited some of my story. But I also know it was LONG!! Either way, it was a great release for me. Happy Mom's Day to you. - Mother's Day 2010 & also here.